Calculator of distances and itineraries in Indonesia. Preparation of the trip to the main places and cities. Calculation of distances and routes in Indonesia. The purpose of the site is to offer a service for calculating distances and routes in Indonesia. The ergonomics of the route calculation tool offer various approaches for determining the best route from the point of departure to the destination. How to ? The easiest way is to set ​​departure and destination and then confirm (by pressing "Calculate route" button). You will have an estimated distance and time for your travel on a dynamic map. Otherwise you can also use the dynamic map by clicking the starting point and the arrival point, that will calculate travel time and distance by car. Directions will then be immediately displayed on the dynamic map. 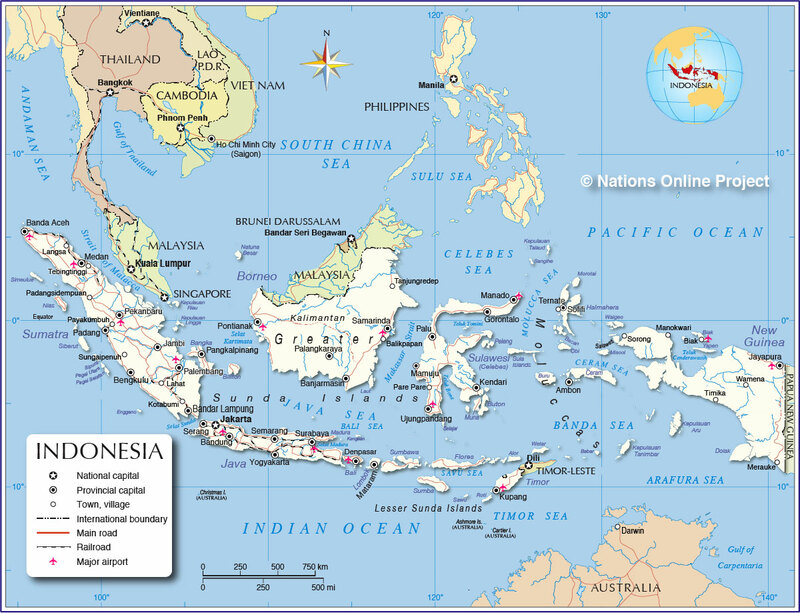 List of the most important Indonesia cities with distances and routes from (Jakarta, , Indonesia). How to get from to main cities ? Distances and durations travel from to most populated Indonesia cities. This section lists the distances from (Jakarta, , Indonesia) to the nearest regional cities. By clicking on the appropriate links, you will get a route between and neighboring major cities (national and transboundary). Travel calmly ! 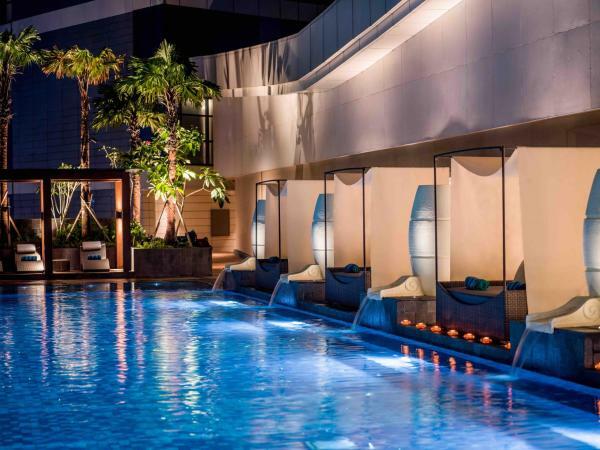 Located in Jakarta, 6 km from Central Park Mall, Veranda Serviced Residence Puri has an outdoor swimming pool, a fitness centre and rooms with free WiFi access. This 4-star hotel offers a 24-hour front desk and a concierge service. This hotel is located 10.25 from the city center . This 4.0 star property has 68 rooms. You can book a room from 700000 IDR. 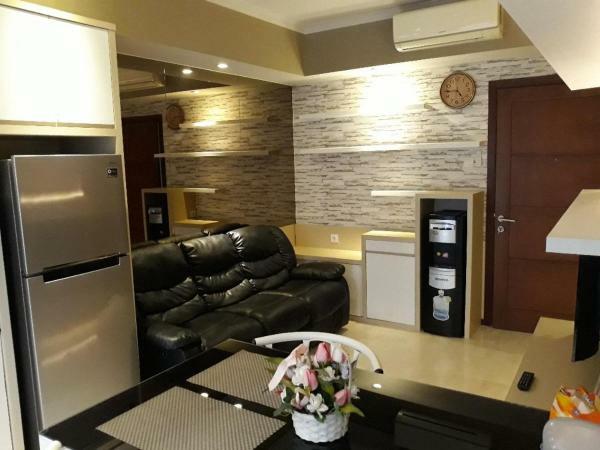 Situated 5 km from Central Park Mall in Jakarta, 2 BR Gallery West Apartment Near MACAN Museum By Travelio offers accommodation with a kitchen. The apartment is 9 km from National Museum of Indonesia. This hotel is located 8.74 from the city center . This 4.0 star property has 1 rooms. You can book a room from 848400 IDR. 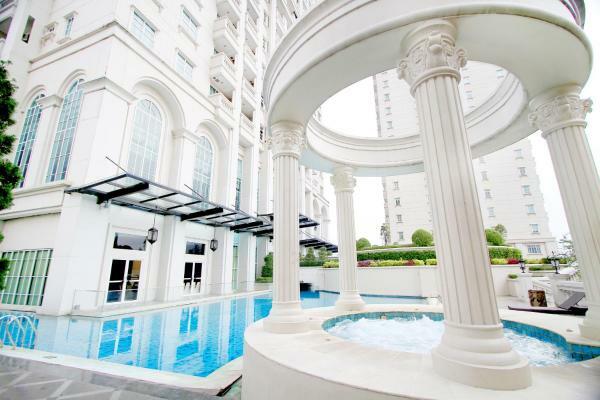 Located in Jakarta, 5 km from Kemang, Grand Whiz Poins Square offers accommodation with an outdoor pool. It provides a 24-hour front desk and free WiFi access throughout the premises. This hotel is located 11.18 from the city center . This 4.0 star property has 148 rooms. You can book a room from 594000 IDR. 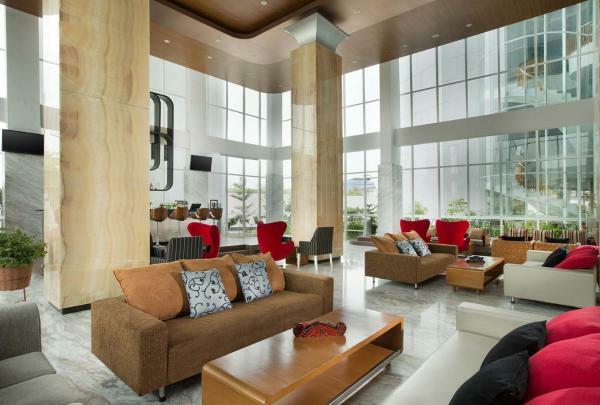 Featuring modern art and free Wi-Fi in the entire hotel, Mercure Jakarta Simatupang has an outdoor rooftop bar, outdoor pool and mini golf facilities. It is just 2 km from Pondok Indah Mall and 1.5 km from Cilandak Town Square. This hotel is located 11.20 from the city center . This 4.0 star property has 231 rooms. You can book a room from 740520 IDR. Somerset Berlian Jakarta offers convenience in spacious self-catering apartments with modern interiors and home entertainment systems. It boasts a large outdoor pool with a hot tub and fitness facilities. This hotel is located 7.13 from the city center . This 4.0 star property has 145 rooms. You can book a room from 1019700 IDR. Strategically located in Jakarta, around 20-minute drive from Ciputra Mall, Grand Tjokro Jakarta offers charming guestrooms and free WiFi access throughout. Jakarta Soekarno Hatta Airport is a 30-minute drive away. This hotel is located 8.87 from the city center . This 4.0 star property has 147 rooms. You can book a room from 532872 IDR. 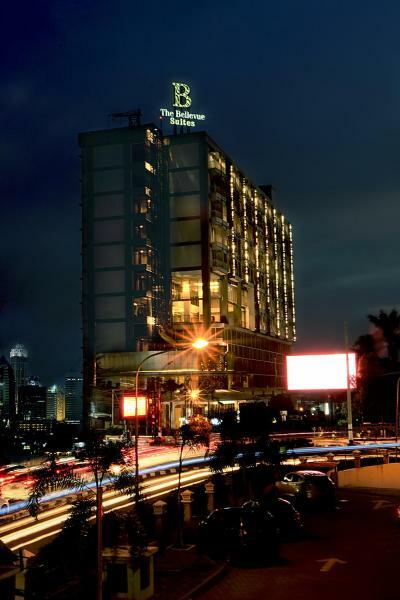 Swiss-Belhotel Pondok Indah is situated in Jakarta, 4 km from Kemang and 6 km from Ragunan Zoo. The hotel features an outdoor pool and a fitness centre. Guests can enjoy a la carte meals at the restaurant. This hotel is located 9.78 from the city center . This 4.0 star property has 159 rooms. You can book a room from 808000 IDR. Boasting a hot tub, Apartemen Belleza Permata Hijau is set in Jakarta. 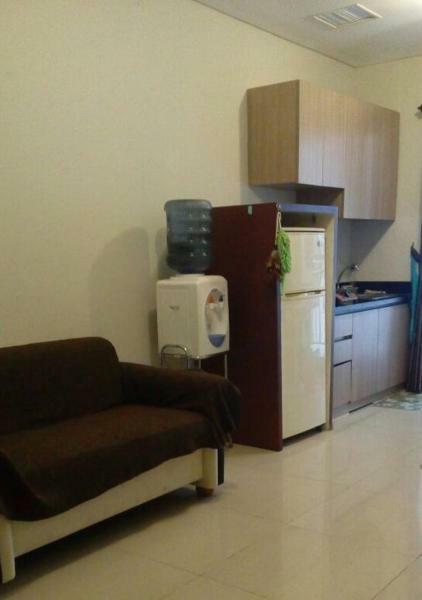 This property is 6 km from Plaza Senayan. The air-conditioned apartment is composed of 4 separate bedrooms, a fully equipped kitchen with a fridge and a stovetop, and 3... This hotel is located 6.94 from the city center . This 5.0 star property has 1 rooms. You can book a room from 10000000 IDR. 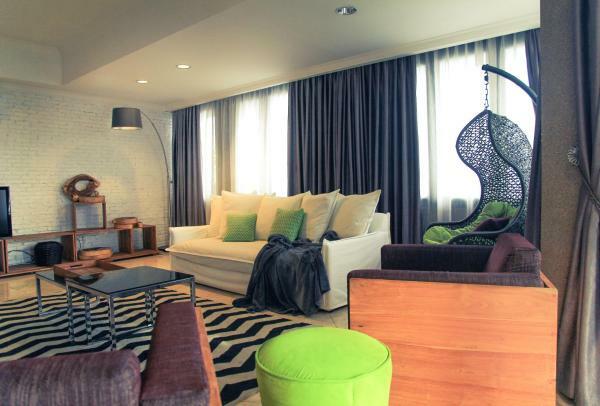 Luxurious comfort awaits guests at The Bellezza Suites. Featuring an outdoor pool, indoor tennis court and a jogging track, this hotel houses a restaurant and spacious rooms overlooking the city. Free internet access is available in some rooms. This hotel is located 6.92 from the city center . This 4.0 star property has 104 rooms. You can book a room from 699000 IDR. Situated within walking distance to Pondok Indah Mall shopping complex, InterContinental Hotels - Jakarta Pondok Indah features well-appointed rooms and suites in South Jakarta. It also has an outdoor pool, 2 dining options and a fitness centre. This hotel is located 8.84 from the city center . This 5.0 star property has 508 rooms. You can book a room from 2396707 IDR. 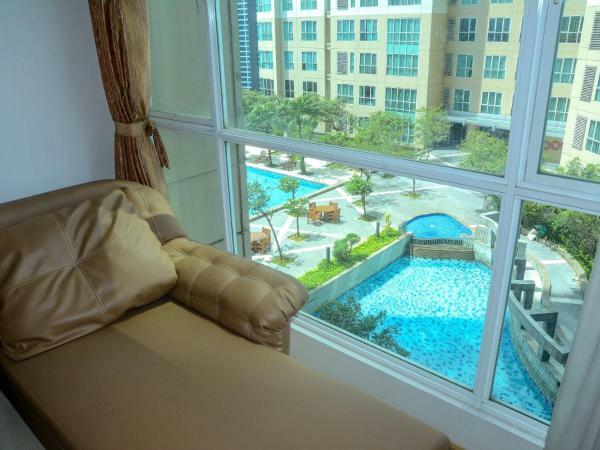 2BR Cityview At Gandaria Heights Apartment By Travelio enjoys a location in Jakarta, just 3.4 km from Pondok Indah Mall and 5 km from Plaza Senayan. 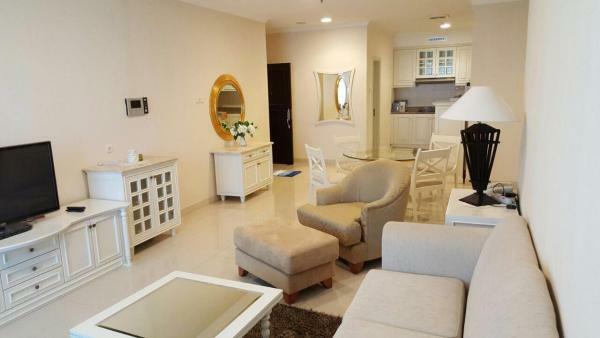 The accommodation is 6 km from the Pacific Place and features free WiFi. This hotel is located 7.51 from the city center . This 4.0 star property has 1 rooms. You can book a room from 1159343 IDR. 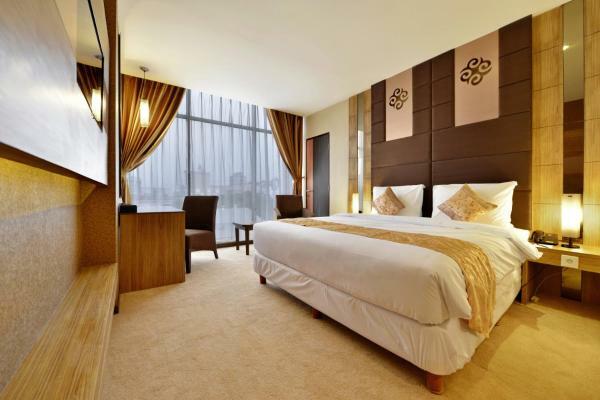 Sheraton Grand Jakarta Gandaria City Hotel offers accommodation in the heart of emerging commercial hub and primer residential area in South Jakarta. The hotel has an outdoor pool and views of the city, and guests can enjoy a drink at the bar. This hotel is located 7.53 from the city center . This 5.0 star property has 293 rooms. You can book a room from 1494900 IDR. Boasting a children's playground, Mall Access! Exclusive 2 BR @ Gandaria Heights Apartment By Travelio is well set in South Jakarta of Jakarta, 3.4 km from Pondok Indah Mall and 5 km from Plaza Senayan. The 4-star apartment is 6 km from Pacific... This hotel is located 7.46 from the city center . This 4.0 star property has 1 rooms. You can book a room from 1193818 IDR. 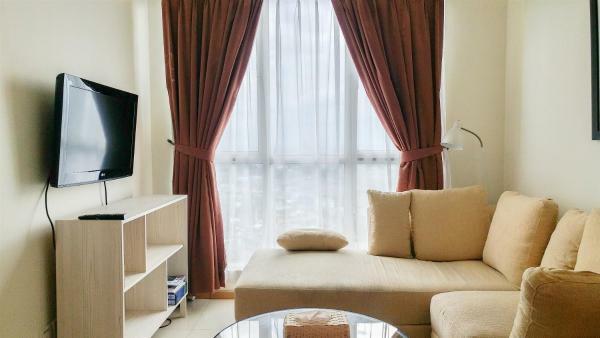 Set in the West Jakarta district of Jakarta, just 4.4 km from Central Park Mall, 1 BR Comfort Madison Apartment Near Central Park By Travelio features air conditioning and free WiFi. This hotel is located 7.48 from the city center . This 4.0 star property has 1 rooms. You can book a room from 476685 IDR. 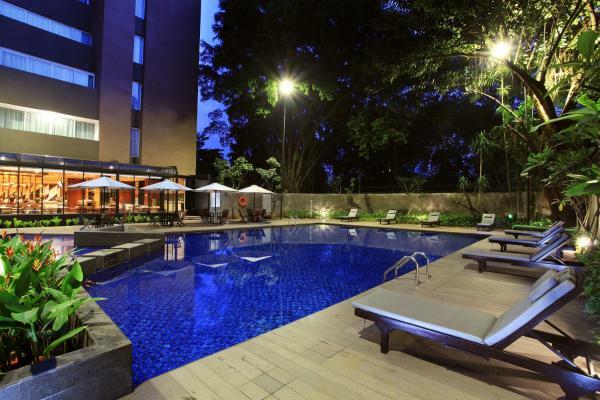 Located within close proximity Jakarta's Central Business Disctrict, Veranda Hotel @ Pakubuwono offer modern and chic city stay featuring and outdoor swimming pool, meeting/banquet facility, and free WiFi access throughout the entire property. This hotel is located 7.12 from the city center . This 4.0 star property has 184 rooms. You can book a room from 890589 IDR. 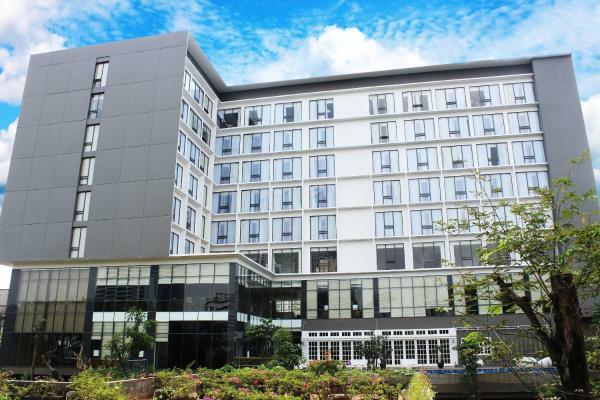 Featuring direct access to Ciputra Mall, Hotel Ciputra Jakarta offers air-conditioned rooms easily accessible from Soekarno-Hatta international Airport. 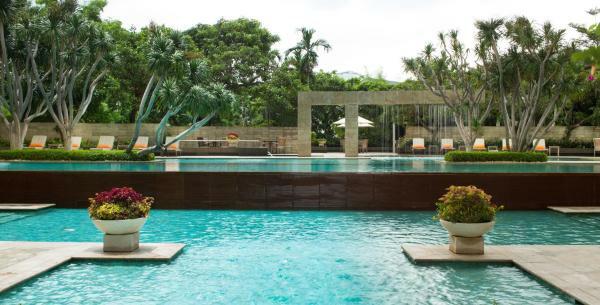 It boasts an outdoor pool with swim-up bar, a restaurant and a bar. This hotel is located 8.23 from the city center . This 4.0 star property has 336 rooms. You can book a room from 680000 IDR. 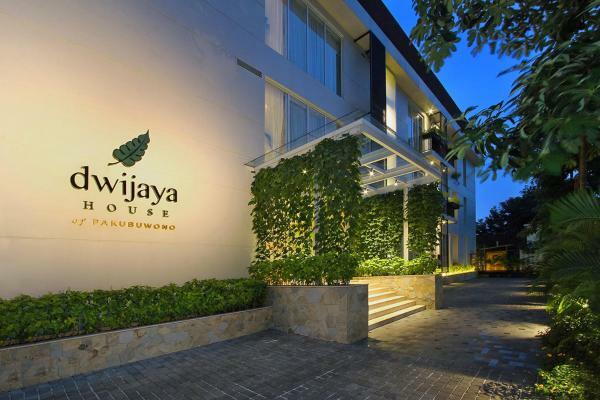 Situated in Jakarta, Dwijaya House of Pakubuwono provides accommodation with free WiFi, within 1.7 km of Pondok Indah Mall. The accommodation is air conditioned and is fitted with a sauna. This hotel is located 8.23 from the city center . This 4.0 star property has 46 rooms. You can book a room from 880000 IDR. Situated 3.5 km from Pondok Indah Mall and 5 km from Pacific Place, Exclusive 2 BR Gandaria Apartment By Travelio is set in South Jakarta of Jakarta. Guests may enjoy free WiFi. This hotel is located 7.30 from the city center . This 4.0 star property has 1 rooms. You can book a room from 764699 IDR. Located a 15-minute drive from Jakarta City Centre, Grand Tropic Suites Hotel offers free parking and fully furnished suites. An outdoor pool and spa await guests. This hotel is located 7.94 from the city center . This 4.0 star property has 188 rooms. You can book a room from 526316 IDR. Offering an outdoor pool and a restaurant, Hariston Hotel&Suites, Pluit - Jakarta is located 5 minutes’ drive from Emporium Mall. Free WiFi access is available throughout the hotel. This hotel is located 10.66 from the city center . This 4.0 star property has 199 rooms. You can book a room from 595000 IDR. 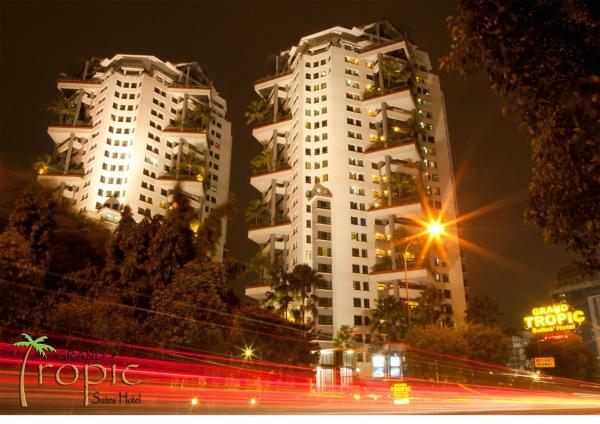 Tropic Penthouse Apartment Grogol offers a two-level penthouse a 5-minute drive from Central Park and Taman Anggrek shopping malls. Overlooking the city, the penthouse comes with a shared outdoor pool and fitness centre. This hotel is located 7.93 from the city center . This 4.0 star property has 1 rooms. You can book a room from 3100000 IDR. Strategically located in the lively South Jakarta area and only a 10-minute drive from Pondok Indah Mall, The Bellevue offers a great city accommodation featuring an indoor swimming pool, free WiFi access in all areas, and free on-site private... This hotel is located 8.33 from the city center . This 4.0 star property has 156 rooms. You can book a room from 550000 IDR. 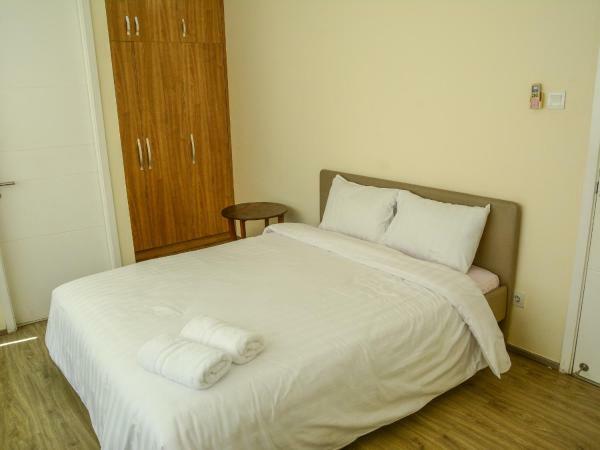 Situated 400 metres from Central Park Mall, Madison Park offers free WiFi. All units come with a seating area, a flat-screen TV with cable channels and a fully equipped kitchen. Some units feature a terrace and/or balcony. This hotel is located 7.40 from the city center . This 5.0 star property has 5 rooms. You can book a room from 750000 IDR. 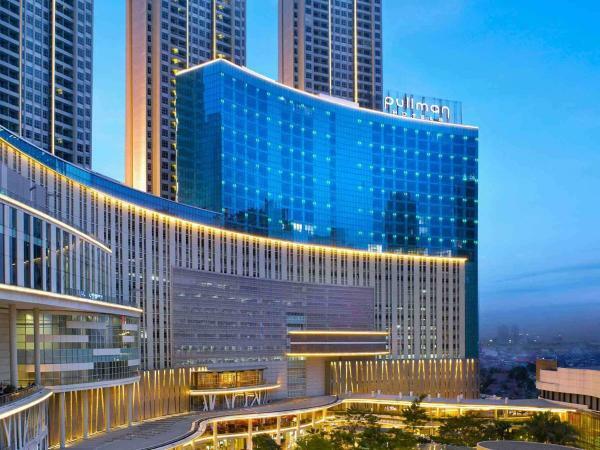 Offering rooms with floor-to-ceiling windows and a rainshower, Pullman Jakarta Central Park houses a spa, fitness facilities and an outdoor pool. This hotel is located 7.43 from the city center . This 5.0 star property has 317 rooms. You can book a room from 1592118 IDR. Situated in Jakarta, less than 1 km from Central Park Mall and 7 km from National Museum of Indonesia, Royal Mediterania Central Park offers air conditioning. The Tanah Abang Grocery & Textile Center is within 8 km of the apartment. This hotel is located 7.51 from the city center . This 4.0 star property has 1 rooms. You can book a room from 750000 IDR.